Here's the most recent Angus Reid poll. It's mostly in line with recent polls, except in MB/SK where the Conservatives got a huge number, and take the last Liberal seat in Manitoba in the aggregate projection. Not a good poll for the Liberals in Atlantic Canada and Québec, and they lose a seat in each of these regions. The Grits are no longer projected to make any gains in Québec. The Bloc is in a sweet spot where the Tories and Liberals almost evenly split the federalist vote. Québec poll averages are almost identical to the 2008 results, but I still have the Tories losing a couple of Quebec City seats because their numbers there, in polls with regional breakdowns, are consistently worse than what they got in 2008. There has been a bit of a slingshot effect during this Liberal slide (and it is a Liberal slide rather than a Conservative uptick, since the BQ and NDP have gone up as well): first, Ontario moved while the rest of the country stayed put. Now, Ontario has been very stable for a while, and the rest of Canada caught up. First, the weekly EKOS concurs with Environics in giving about 29% to the NDP in BC. Otherwise, there is little change from last week. Second, a CROP Québec poll has the NDP at 16% in La Belle Province, while the Liberals are now 14 points behind the Bloc. The latter is consistent with the latest results from Rest-of-Canada pollsters, and is very bad news for the Liberals: last month, CROP and Léger had the Grits trail the Bloc by only 7 and 3 points, respectively. So the recent poor Québec results for the Liberals seem not to be due to Rest-of-Canada pollsters undercounting the Liberal vote in Québec, as they are believed to sometimes do. This seat count has every party within 5 seats of their 2008 result. 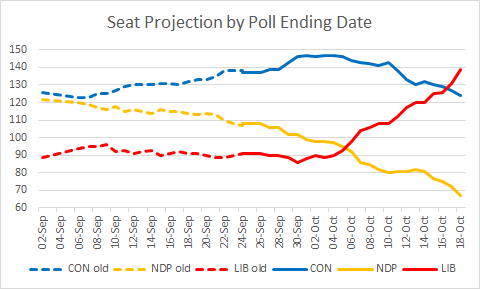 Pressed for time today: no analysis, but to point out that this is the first time the Conservative seat projection has decreased in about 7 weeks. Today is the day on which, by law, we should have had the 40th Canadian general election had the first Harper minority not been defeated. Of course, we all remember that it wasn't defeated - the Prime Minister simply decided to break his own law and call an election last year. Interestingly, current standings in polls are quite similar to the results from 2008. But of course, had an election not occurred last year, who knows what the polls would show now. A Harper majority? Maybe - we're close to that anyway. A Dion minority? Not totally impossible, but, um, no. After Strategic Counsel and EKOS, Angus Reid now also has the Tories above 40%, in majority territory. However, Harris-Decima produced a poll (only partial details available through CP) with the Conservatives still far shy of a majority. All the polls released in the past two weeks agree on one thing: the Liberals are below 30%. The main disagreement in the polls is about Ontario. Angus Reid, Strategic Counsel and EKOS have the Tories up 16, 16 and 13.1 respectively in their latest polls. However, Ipsos Reid and Harris-Decima both peg the Conservative lead at just 4% there. That's the difference between a majority and a minority. The Conservatives are now projected to increase or maintain their seat count in every region, except in Québec, where they're still expected to lose two marginal ridings. Also, for the first time since this website was launched, the Conservatives are projected to win more than twice as many seats as the Liberals. The Grits may be doing a bit better than my projection suggests in Québec: we haven't had numbers from CROP or Léger in the past couple of weeks, and those generally favour the Liberals, counterbalancing the fact that many national polling firms tend to undercount them in Québec. Still, that's no more than a 5-seat difference, which would still leave the national Liberal seat count firmly in Dion territory. And seat switches between the Liberals and the Bloc obviously have no bearing on the Tory seat count, which is the relevant number nowadays. More good news for the Tories here. I believe that this is the first poll since Dion's coalition-talk fiasco where the Tories are ahead of the Grits and Dippers combined. This has never happened at an actual election during my lifetime, and not so long ago it was the Liberals getting more than the PC and Reform/Alliance combined. Is this just a blip, or a sign of a durable shift in Canadian politics? 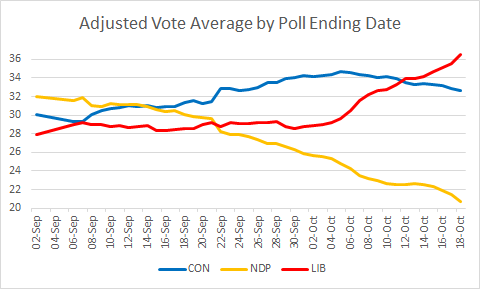 Compared to last week's EKOS, this poll shows the Conservatives increasing their lead everywhere except in Québec and BC. Based on this poll alone, the Tories would win a majority with a half-dozen-seat cushion, while the Liberals would win about 66 seats - Stockwell Day's performance in 2000 (and that was out of 301). The NDP's national poll average may be below 15%, but its seat count remains respectable due to its number holding up in BC and to Liberal weakness in Ontario. Will the Tories get the last 5 seats that separate it from a projected majority? Stay tuned! The Liberals are now projected to do just worse than under Dion. Their expected gains in Québec have almost entirely evaporated: the poll average I'm using puts them 12% behind the Bloc, barely less than the 14% registered at the 2008 election. However, some of this may be a temporary blip due to the recent events surrounding Denis Coderre. Putting Québec and Ontario together, the Grits are now the third party in Central Canada, well behind the Tories, but also behind the Bloc. Atlantic Canada is now playing two important roles: (a) preventing the Tories from forming a majority; (b) preventing the Bloc from approaching Official Opposition territory. The weekly EKOS is out, and is disastrous for the Grits: they have lower support nationally than in the 2008 election. In this poll, the Conservatives take the lead in Atlantic Canada, pass the Liberals in Québec, more than double their lead in Ontario from last week's EKOS, while the NDP passes the Liberals in BC. This polls also asks about party leaders' handling of their jobs. The following net approval ratings speak for themselves: Harper -3.6%, Ignatieff -31.6%, Layton +2.6%. My first reaction when I saw this poll was that these numbers, if borne out, would result in a solid Conservative majority. Not so after crunching the numbers though! Even such a meltdown for Ignatieff would only put Harper on the cusp of what he's desired for so long: 154-155 seats. For the first time, the Conservatives are projected to gain seats if an election took place in the past week. They are now very close to a majority. The Grits have retreated to their 2008 levels, while the Bloc and NDP post very modest losses. The problem for Harper: much of his party's recent swell in the polls was probably a result of Ignatieff's (feigned) eagerness for an election. So if the Conservatives engineer their own defeat, a good chunk of this goodwill may instantly evaporate. Besides, many believe that Harper will be under pressure to leave if he delivers yet another minority - however strong it may be. So perhaps he's not exactly burning to roll the dice quite yet, since a majority is of course no sure thing. The Liberals though, look less and less like a government-in-waiting by the day. Musing about gimmicks like high-speed rail and defending Suaad Hagi Mohamud are not valid substitutes for a platform. Actually, don't even mention platform - we now have absolutely no clue what the Grits stand for anymore, beyond the fact that they're not Harper and not socialists. Or are they? After all, Ignatieff seems to like the oil industry in Alberta, and the 360-hour EI threshold is so far to the left that the NDP didn't even bother coming up with a more lefty proposal. Ironic that one of Canada's greatest intellectuals is now in danger of becoming a failed politician due to a lack of credible ideas. The silver-lining: these things can turn around very quickly, so Ignatieff still has time, especially since Québec is nowhere close to tipping to the Tories. If that happens though, the following storyline would write itself: "Canada has opted for a Conservative majority, and is just waiting to go to the polls." So Mr. Ignatieff - stop tempting fate, OK? Not much time today, but I've incorporated to my aggregate projection the following 3 polls published over the past few days: Ipsos, CROP and EKOS. 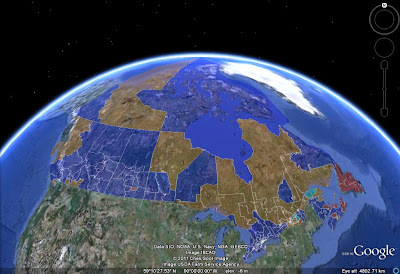 The Québec projection finally moved, in favour of the Conservatives. This looks quite a bit like the current parliament, despite the fact that the Tory lead is now almost 5% smaller than in the 2008 election. The main reason is Ontario, where the Conservative has actually increased. Liberal gains elsewhere are for now strikingly inefficient.